One-hundred and fifty members of the Indian army have arrived in Chengdu to take part in an anti-terrorism exercise with China after a five year hiatus. The joint anti-terror drill will take place at a time when China is stepping up its campaign against terrorism after last week’s suicide attack at the Forbidden City overlooking Tiananmen square. The 10-day drill codenamed “hand in hand” will be formally inaugurated tomorrow at a designated area close to the city of Chengdu. 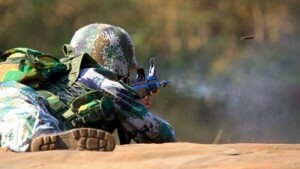 It will be the third joint military exercise between the two nations after a gap of five years. The first exercise was held in China’s Kunming city in 2007. The two neighbours have seen a flurry of high profile visits in recent times including Chinese Premier Li Keqiang’s visit to New Delhi followed by the return visit of Prime Minister Manmohan Singh to Beijing last month. The Chinese Defence Ministry said last week that Beijing and New Delhi are considering establishing a hotline between the headquarters of the countries’ armed forces. A crucial Border Defence Cooperation Agreement (BDCA) was signed between the two countries during Singh’s visit. The BDCA is being hailed as a powerful tool to prevent skirmishes on the border that is not yet fully demarcated. The two nations are seeking stronger ties amid new realignments in the region, Chinese media said after Singh’s visit. “History can be made in a moment, especially when two of the world’s most populated nations are determined to do so,” a commentary by the state-run Xinhua news agency said. In a reference to recent reports of the much-hyped American Asia pivot which reportedly seeks to “contain” China, the Indian prime minister said “old theories of alliances and containment are no longer relevant”. “India and China cannot be contained and our recent history is testimony to this. Nor should we seek to contain others,” Singh said in Beijing.